Last Saturday, after taking Graham out back and hosing him off, we got dressed and headed up town to watch the parade. Despite his digestive pyrotechnics the night before, he was in good spirits and seemed very excited about the prospect of watching a parade. What is it about kids and parades, anyway? I always thought it had to do with the candy being throw haphazardly out of car windows at innocent children loitering in the street, but in the case of my boys this is not the case. As their mother, however, I do see the allure. 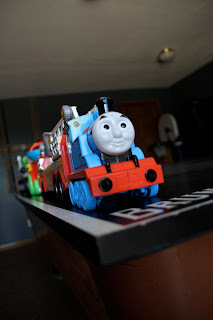 When Cael hears "parade", he thinks of only one thing: a train. Okay, so it's not a really obvious connection, and I agree that the only real commonality is that both a train and a parade travel in a line. For Cael and Graham, that seems to be enough. Ever since our train adventure, Cael likes to line up not only his toys but anything he can get his hands on. "Look, Mommy! I made a train!" "I see that Cael. Are those your shoes in a row?" "Yeah, it's a shoe train. Come look at my other trains." "Wow, you've lined up all of the tissues from the Kleenex box. That's just great." "Yeah, it's an AH-CHOO choo train!" With that understanding, I wasn't surprised at their strong desire to see the ultimate train-- cars, firetrucks, animals and people ALL going down the street in one unified, indivisible train. We arrived about 20 minutes before the parade was to start in order to secure our really bad spot in direct sunlight. Neither of the boys seemed to mind the heat once the very first sirens started blaring and the police car signified the beginning of the parade. And then there was a firetruck, and then an ambulance. And then another firetruck and another ambulance. One more firetruck, followed by the fire chief. Three more firetrucks, another ambulance and a partridge in a pear tree. I turned back to Joel, who had retreated several yards away to a tiny foot-wide patch of shade. "There seem to be a lot of emergency vehicles in this parade." Mistake. "Why are there lots of 'mergencies, Mommy?" "Not emergencies, Cael. Just cars and trucks that go to emergencies to help people." "But where is the 'mergency?" "There is no emergency. They are just here for the parade." "But if they go to 'mergencies, the 'mergency must be here!" "No emergency, Cael. Not today. There aren't emergencies on parade days." Ever have to blatantly lie to your kid so they'll stop asking you questions and eat candy they find on the street? Once he got into the routine of filling his bucket with his loot, (and after only two near misses with an antique tractor) Cael was invested. He would have the best bucket with the best candy-- only he was too tentative to grab the candy thrown in his direction and two elementary-aged girls on a sugar binge beat him to almost every piece. Just as well... before it was over we would wind up with 47 suckers, and I won't let him eat those just yet. He's perfectly capable, but I'm no fool, and I like my carpeting just the way it is. 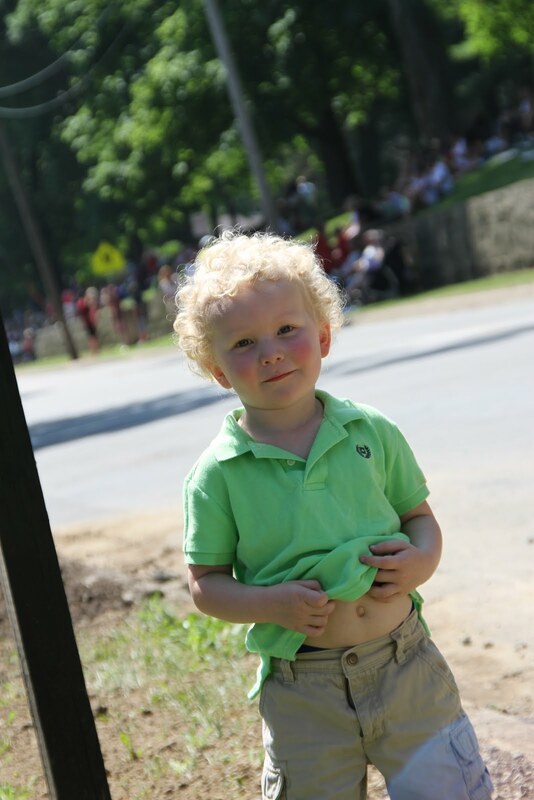 Graham also enjoyed the parade, and made the most of his time by causing onlookers to swoon and throw candy at him. He does seem to have that effect on people in most situations, minus the enthusiastic candy throwing. His practically-clear blonde hair and blue eyes just scream all-american, and to see him waving a miniature flag on the sidelines of a summer parade was more than most little old ladies could handle. As the parade was coming to a close, I was worried that the universe would implode from the intensity of his cuteness. Thankfully, though, Daddy was there to pull his shirt up like the dancing "Jones County Fair" girls and take his cuteness to a creepy level. Good thing he was there. I heard that all of the emergency vehicles were unavailable due to a parade.